This is a place that will feel very much like the surface of the Sun. When deuterium-tritium operation begins, the ITER divertor will carry a heat load twenty thousand times higher than that of a hot July day in Provence. As if that wasn't enough, the divertor structure will also have to withstand tremendous magnetic forces that will press and pull with a force on the order of one hundred tonnes. An essential component of the ITER machine, the divertor is also one of the most challenging to build, assemble and install. Each nine-tonne cassette will be installed inside the vacuum vessel through remote handling operations. The highly complex and delicate installation sequences are being demonstrated and validated at the ITER Divertor Test Platform Facility in Tampere, Finland. 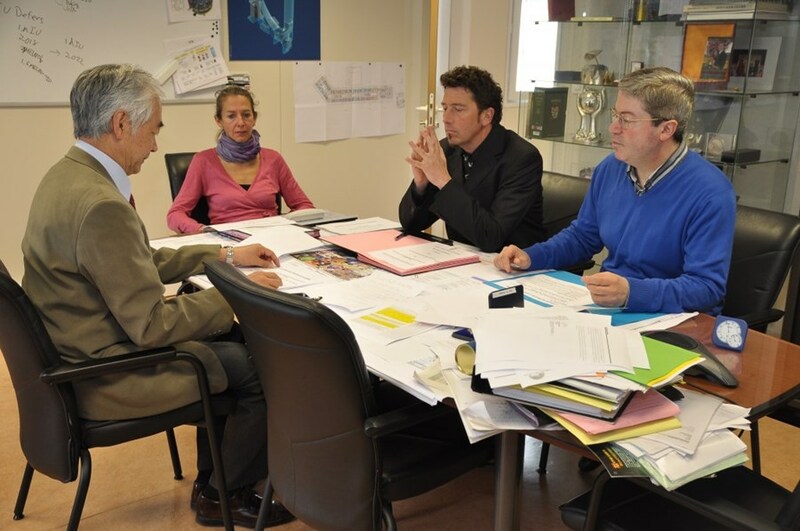 The Procurement Arrangement for the Divertor Cassette and Assembly was signed on Tuesday, 19 April. From left to right, DG Motojima; Paola Miele, Procurement & Contracts senior administrative officer; Frédéric Escourbiac, Tungsten Divertor Section leader and Mario Merola, head of the Internal Components Division. The Procurement Arrangement for the divertor cassette and assembly was signed on Tuesday, 19 April. It covers the manufacturing by Europe of 60 cassette bodies (54 cassettes plus 6 spares) and the integration of the components and diagnostics systems provided by other Domestic Agencies as part of different procurement packages. "The key challenges in this Procurement Arrangement are: one, the manufacturing tolerance to meet the interfaces (on the order of a fraction of a millimetre); and two, the assembly sequence of the different divertor components," explains Mario Merola, head of the Internal Components Division. "Planning and coordination will be paramount." Following the production of a full-scale prototype for assembly trials, series production should begin in 2015. 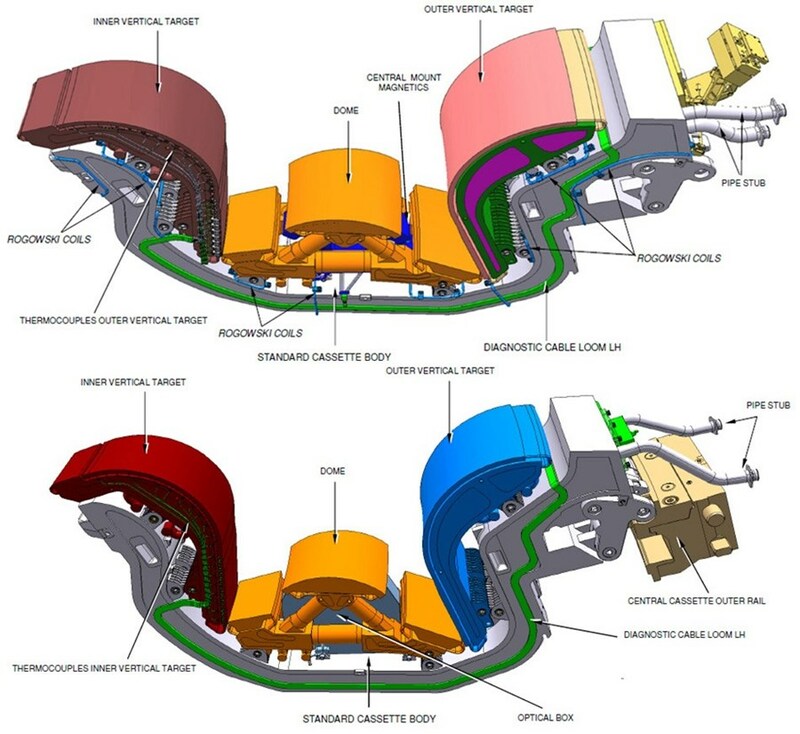 The present schedule plans for the installation of all 54 cassettes beginning in 2021 during the second phase of ITER assembly; the divertor will only be needed when hydrogen-helium operation begins in 2022. Click here to watch a short video sequence of a divertor cassette insertion into the vacuum vessel.